Khalil Ibrahim was a master storyteller and through allegory, he told the tale of his origins, the Malaysian East Coast and landscapes that fuelled his passion. Khalil’s landscape works were undoubtedly his forte and beloved by his collectors. This is owed to his attention to extraordinary detail, artistry and sheer passion. 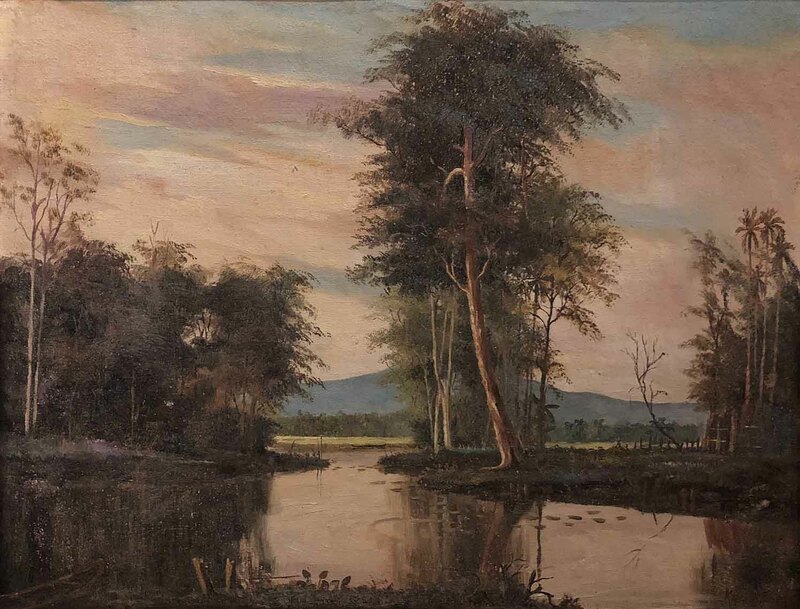 Khalil began painting landscapes during the time when landscape painting in Malaysia was at its apex, before pursuing art studies at the prestigious St. Martin’s School of Art in London. Together with artists Yusoff Sulaiman and the late Nik Zainal Abidin, he learnt the fundamentals of painting from Nik Mahmud Idris, a Malay school inspector who returned to Kelantan after an art education spell in Singapore. The revolving theme in this class was the pastoral setting of kampungs and it was through this experience that Khalil enhanced his ability of capturing nature in all its glory. Evident in “Sunrise, 1950s”, he possessed the ability to transform an unassuming scene to a brilliant one where he played with colours and showcased his established precision. The setting of “Sunrise” is as its title suggests, during the break of dawn where strikes of pink are painted across the sky against a mountain at the horizon. At the foreground, a breathtaking scenery of tall, mighty trees encapsulates a lake and takes centrestage. It doesn’t take a discerning eye to notice the minutiae in this work such as the leaves of the trees, the clouds in the sky, the ripples in the water and the clarity of the lake that mirrors the greenery that surrounds it. The 1950’s was when Khalil produced bounteous landscape works similar to that of “Sunrise” in terms of craft and scenery. These include the “Pahang Series”, “Landscape Series” and “Sunset”, all produced in 1957. Khalil’s landscapes were his Eden and it can be observed that he was not concerned with any specific object or subject in his vast landscape which was how he liked it and wanted to depict.